Many gardeners feel that Small Garden Design is difficult, in a small space you can’t fit in that many plants. However with a little careful planing and use of vertical space you can fit in 100s of plants into even a small courtyard. Designing for small areas has a different set of rules. 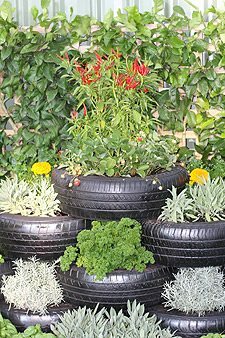 Material, plants and garden furniture for small garden areas, courtyards and such require careful consideration. Design is often more critical than larger garden areas. Scale is important, and maintaining both a sense of space and a functional garden area that fits in with individual needs can be a challenge. With town houses, dual occupancy and inner city dwellings many with small courtyard gardens the decision on how maximize space must be made. Pictured top right we have an integrated approach to small garden design (picture above) with Vertical Garden Walls, Decorative Wall panels and Bench seating to maximize use space. An approach to design for small gardens. The trick is to create microclimates use climbing plants and use hanging baskets and wall gardens to make the most of space. If you are using taller plants, then underplant with shade loving plants. Make the most of sun to create warm humid corners to make the most of plants that like these conditions. Try using epiphytic plants to add to the overall impact. In a small area make the most of garden walls and fences. Instead of growing out grow up (and along). Think climbing plants and creepers, consider espalier or even a ‘vertical garden’. 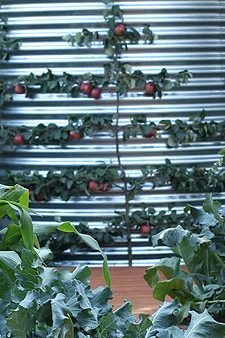 Pictured we have an espaliered apple tree, a great design idea for smaller gardens. A productive fruit tree and a decorative addition to a small area. Look for plants that naturally have a columnar habit. Even large trees such as Pyrus come in cultivars that have a narrow growing habit. Buxus Sempervirens Graham Blandy (Emerald Pillar) is a narrow growing box hedging plant, makes a great screen in a small garden area. Add perspective to make small areas seem larger, use lines to lead the eye to a feature at the back of the garden and add a sense of depth, a water feature perhaps. Consider decorative wall panels rather than large sculptures. Or perhaps take a different approach. 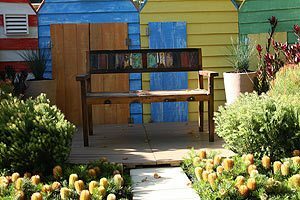 A small space divided into two by a screen or garden planting can give the illusion that their is more behind the dividing screen. Or perhaps a garden mirror can create the illusion of depth. Use garden furniture that can be packed away or consolidated, an extension table can provide extra eating space when needed and make space when not extended. Consider using a bench seat rather than chairs to save space in smaller areas. 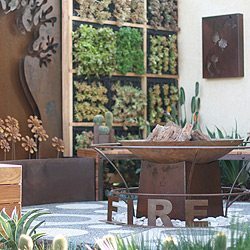 Two simple ideas are using vertical gardens, and feature objects. 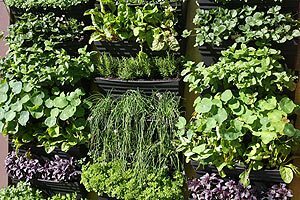 A vertical garden is a natural space saver, as well a great for covering walls. A feature seat in a small garden may be all thats needed to add a real design feature.